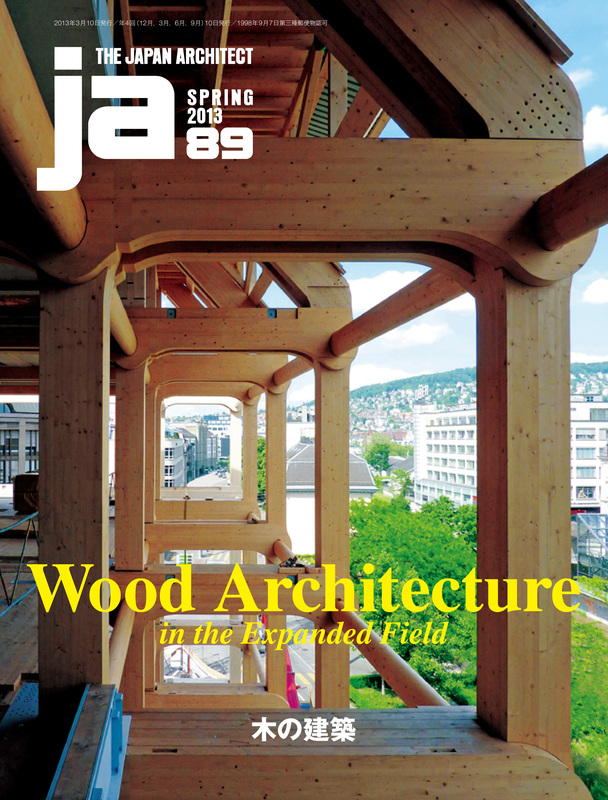 JA89 is a special edition devoted to wood architecture. Japan has a long history of constructing buildings with wood. They include styles of houses that conform harmoniously to the forces of their environment. As a nation rich in forest resources, Japan has produced wood buildings of astonishingly diverse sizes and purposes. And yet, in modern times, Japan’s beautiful townscapes of wood buildings and habits of living in harmony with nature have increasingly been lost. Reasons for this include the superior strength of steel and concrete, the imprecision of wood as a building material, and its ambiguity as a design material. Today, however, amid an urgent need for sustainability, architects are attempting to perceive and employ wood in new ways. This edition features 23 projects by architects who are taking new approaches to wood. Gathered in its pages are buildings that give play to the richness of wood, buildings that seek sustainability in order to protect forests, and buildings that endeavor to recover the beautiful landscapes of the past. We asked each architect the question—Why, at this particular time, are you creating architecture with wood? The texts herein comprise their answers. We similarly asked David Adjaye, a global architect influenced by Japan’s wood architecture, and Pekka Heikkinen, a specialist in wood architecture in Finland, a country possessing rich forests like Japan, to explore this question in their opening essays. We invite you to see each architect’s endeavor and reflect on the rich diversity of wood design now underway in response to the needs of our global environment.